The world is currently experiencing an extraordinary amount of destruction and heartbreak with catastrophic natural disasters, global economic turmoil, and resulting mayhem throughout society. 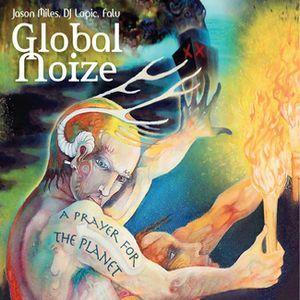 A Prayer for the Planet, the sophomore album from Global Noize, answers the desperate call for help by providing peace of mind no matter the dire situation. Seasoned jazz musician Jason Miles teamed up with turntable maestro DJ Logic to form Global Noize, a project dedicated to mixing the world’s eclectic musical styles to create funky fresh jams enjoyable to all. Joined by a crew of talented musicians and friends in studio sessions as well as live on stage, Global Noize cooks up a concoction of jazz, electronic, and funk. The group’s latest release opens with the soothing title track as the sweet voice of female singer, Falu begs the world to come together in this time of unrest. The album continues to relax listeners with smooth jazz tunes including “Tokyo Sunrise” and “Walking on Air.” But just when the vibe starts to become dull, Global Noize picks up the pace in the second half, fusing dub drums with a sitar on “Wanna B With U,” a psychedelic hymn calling for one last good time before the disastrous future arrives. Spreading the distress signal to the entire human race, Global Noize takes listeners on a trip around the globe by mixing instruments from the far corners of the world. The result is a diverse blend of music that unites the people of Earth in the common struggle for peace and preservation. The planet may be on the verge of devastation, but Global Noize has created a remedy for those affected and a rally cry for those willing to stand up and help.